Take to the BMX track and complete three laps of each track within the time limit to be allowed to tackle the next course. You're also up against the computer, who is awful on the first course, but very good on the rest of them! A friend can also try and beat the clock with you. Even though I can't complete the third course (and there are seven of them in total), I still like this game a lot. The action replay feature is a neat touch, the graphics are good, and the music on the menu is stunning. See also: BMX Simulator 2, Pro BMX Simulator. It's more of the same here, except that you're up against three other bikers rather than two, and either one or two players can join in. The courses consist of the usual obstacles, but sadly, this game is nowhere near as good as its predecessor. Your bike is far too hard to control and more often than not, you'll be flown off the track and into the rubble. In actual fact, the game is little more than a cut-down version of Pro BMX Simulator with only one set of courses, and it's even more difficult than that game. See also: BMX Simulator, Pro BMX Simulator. 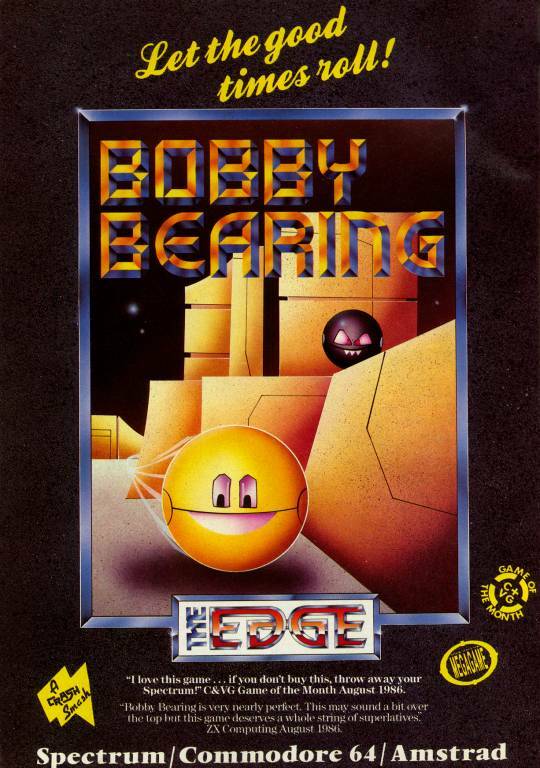 Bobby is a spherical droid, and his five chums – Osborne, Boogle, Bungo, Bert, and Barnaby – are lost in a large maze. It's his job to find them and return them to where he started by pushing them along. However, the maze is huge and is filled with all manner of nasty traps such as switches, crushers, and black balls which will attempt to knock you out. The maze is viewed in isometric 3D and it looks quite good, although there are very few sound effects and no music. Nevertheless, this is a lot of fun to play, and exploring the maze is almost as much fun as finding the other droids. Bobo's in a prison and is trying to make his escape, but he'll have to complete some tasks first. Bobo's plans seem a bit awry to me – the five tasks, in order, are: serving soup to the other prisoners, peeling potatoes, helping the other prisoners to flee by using a trampoline, jumping to and fro on high-voltage wires, and keeping the guards asleep. The graphics and animation are marvellous, done like only the French can do them, and the tunes accompanying each task are nice, too. However, the tasks, though fun at first, become cumbersome after a while and you may lose interest. The game only comes into its own when you play with a friend and see who can get the highest score. Ah, Bob Monkhouse! This is a computerised version of the 80s TV show which was presented by him. It's a quiz game which also has an element of bingo in it; in each of the three rounds, you have to fill in certain squares on your bingo card, and the first player (out of four) to do this wins a prize. In the final round, the first player to fill in all the squares goes on to the end game, to win a holiday. Unfortunately, you don't really get to win all the prizes in real life. 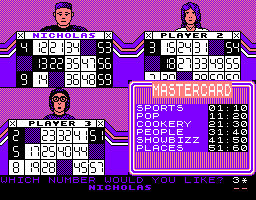 The graphics aren't bad and the game is simple enough to play, but the questions repeat themselves much too often. 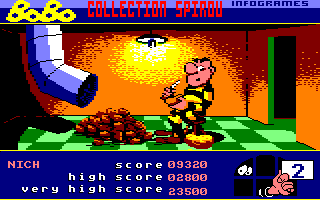 This game wasn't released in the UK until 1988. 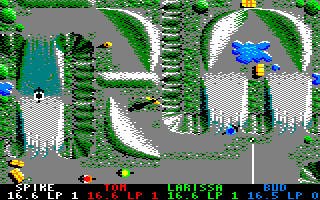 I can't understand why it wasn't released earlier, because the quality of the graphics is beyond description – how people must have gasped in awe of them back then! Erm, oh yes, the game... Bob Winner is on a quest to find a lost civilisation, and has to collect three keys which are being held by three opponents that he meets on his journey – two boxers and a gun-wielding cowboy. To fight them, Bob has to find the right object. There are only about twenty screens, but they all feature stupendous digitised backgrounds. The graphics and animation are without a doubt the best I've ever seen on a CPC, although the game ultimately lacks depth and isn't that big. More Tolkien spoofing in this text adventure game from Delta 4, the creators of Bored Of The Rings. Guide the hapless Boggit, Bimbo Faggins, and the kooky wizard Grandalf, along with Thorny and his band of dwarves, to vanquish the Dragon Daug and steal back the treasure. Well, that's supposed to be the plot, as no opportunity has been missed to poke fun at The Hobbit in this rather amusing parody. While it suffers the same drawbacks as its predecessor – the graphics are not exactly top notch and the sound effects and music are lacking – the game more than makes up for this with its irreverent humour. Some of the puzzles are tricky, but aren't outrageously difficult, and the gags to be found in almost every corner of the game make this a gem. Here's a bizarre game where you control a bloke on a spring or pogo stick of some sort, who has to reach the exit of each screen by jumping from platform to platform, avoiding the monsters that fly around the screen. You have to get the strength of the jump just right, or you'll miss the platform and fall off the screen. 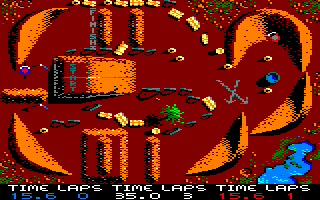 The graphics are pretty crude and very flickery, and there are hardly any sound effects. There are 20 screens, but most people will be screaming in frustration by the time they reach the third screen. Watch a YouTube video of this game by: GameHammer Classic Gaming. Terrorists have broken into the Sellerscale nuclear power plant and planted bombs all over it. You must defuse them, and at the same time, guide used fuel capsules into the crate. They're automatically controlled by the computer, and when you move over them, they will follow you – unless they touch the Balloid which also roams around the screen. The amount of radioactivity increases when a bomb goes off or you touch the Balloid. 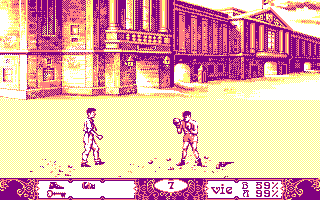 At first, it seems that the game is OK, despite the rather simple graphics and almost total lack of sound. However, it's a bit boring, mainly because it's too easy and extra lives are easy to obtain. This was a fun and unique game that was a rave in the arcades back in the mid-1980s. 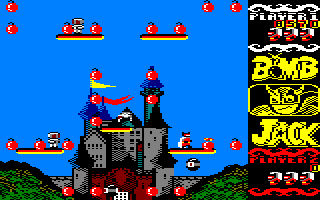 It's still fun to play today, and the CPC conversion is a good one too. The aim is to jump into flight and collect all the bombs on the screen. Collecting lit bombs in sequence rewards you with bonus scores and special abilities. Several nasties begin to appear as you fly around, making progress a little tricky. This is a great game with good graphics displaying various scenic backgrounds, smooth sprites and varied sound effects. Sadly, there is no music, which is a shame. See also: Bomb Jack II. Watch YouTube videos of this game by: jgonza, Metr81, Novabug, Xyphoe.